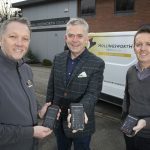 New health and safety app – thought to be UK-first – launched by firm marking 30th anniversary | News by Wales Express News, People Before Profit! 5/7: Brothers Paul and Shaun Hollingsworth set up their construction and civil engineering firm 30 years ago. 9: From left to right; Brothers Paul and Shaun Hollingsworth with Rob Saunders, Daydream Designs Director and Co-Founder who helped to design the app. 90/11/15: From left to right Paul Hollingsworth, Rob Saunders, Daydream Designs Director and Co-Founder who helped to design the app, and Shaun Hollingsworth. 18/25: Hollingsworth Group turned to Holywell creative agency Daydream Designs for help with developing the new health and safety app.